This post is just a random thought about Acumatica and a historical event that I remember learning about as a kid. I remember learning about the “Golden Spike” in my American history class when I was in high school. The “Golden Spike” is the ceremonial final spike which was driven to join the rails of the First Transcontinental Railroad across the United States connecting the Central Pacific and Union Pacific railroads on May 10, 1869 in the Utah Territory (click here for the Wikipedia article). It was a fierce competition between two railroad companies: the Central Pacific (coming from the West) and the Union Pacific (coming from the East). Each company had huge land incentives tied to how much track they could lay. It brought the United States together in a big way and attracted a lot of attention. The final ceremony has come to be considered one of the first nationwide media events. The technology (trains running on tracks) had to be good enough to make the endeavor worth the incredible effort that it took. It’s very unlikely that anyone would have attempted to build a “Transcontinental Walking Path” or a “Transcontinental Canal” for boats. 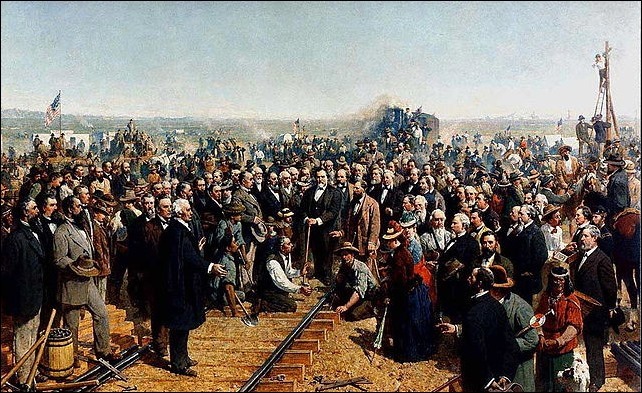 The “Golden Spike” was only possible at the right time in history because the right technology was available. It laid the infrastructure for easier transportation of people and goods between the Eastern and Western portions of the United States. This was a big step towards a more unified United States. Acumatica is the “Golden Spike” joining together two fiercely competitive camps of people in your organization. There are two camps of people in companies: front office people and back office people. Each group has a very strong opinion of how important they are and they often get in debates with each other about which group is more important. The reality is that both groups are needed in your organization. Without the front office people, there would be no business because there would be no work coming in the door. However, without the back office people, there also would be no business because there would be no way to be profitable. Each group has worked tirelessly from different directions to bring your organization into the digital information age. Traditional ERP systems were definitely oriented towards back office people with their focus on accounting, logistics, and manufacturing processes. Modern web-based CRM systems like Salesforce are oriented towards front office people with their focus on the customer process. Acumatica is the “Golden Spike”, giving you a platform that is tailored to both the front office and the back office. It also allows you to have unlimited users, giving you a hug incentive to bring everyone in your organization together onto one platform. Acumatica can bring your organization together in a big way. Every ERP implementation attracts a lot of attention in a company because it affects so many different people. But too often, after the initial optimism wears off, everyone returns to their departmental silos and the finished product doesn’t live up to the hype. Much of the challenge during an ERP implementation is related to communication. Sometimes the communication effort can feel like a full-scale media event, but it’s worth the investment. If done correctly, an ERP implementation can bring your organization together and Acumatica can give you the platform that you need to make it happen. Acumatica has arrived at a point when web-based technology is mature enough to handle ERP. However, ERP needed to be rebuilt from the ground up in order to take advantage of the latest in technology. We are at the right point in history to have the “Golden Spike” for ERP, joining together the front office with the back office, because we have the right technology platform in Acumatica to do it. Acumatica can be the infrastructure that makes it possible for better transportation of information in your organization. Acumatica makes it possible for information to move faster and more securely which leads to a more unified situation and enables more intelligent decisions at all levels of your organization.